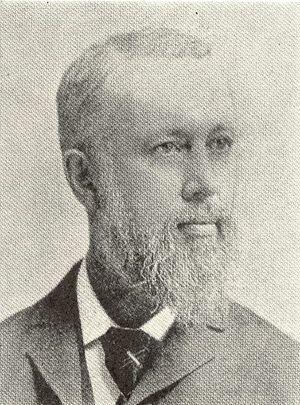 William A. Anthony, AIEE President, 1890 - 1891, professor of physics and mechanics at many U.S. universities. In addition to teaching, he also contributed articles to many electrical engineering magazines, and was an electric engineer consultant in New York City. Anthony was president of the AIEE from 1890 to 1891. William Arnold Anthony, scientist, was born at Coventry, R.I., 17 November 1835, son of William H. and Hannah Whipple (Arnold) Anthony, and a descendant of John Anthony, who came, with his wife, to North America about 1646. He was educated in Washington village, R.I.; the Friends' School, Providence, R.I., and the Providence Conference Seminary at East Greenwich, R.I. He entered the scientific school of Yale College, and graduated at the head of his class, with the degree of Ph.B., in 1856. For a short time following his graduation, he was principal of the public schools in Crompton, R.I., and he taught for a year in the Providence Conference Seminary. He spent one year in a cotton machinery manufactory, to acquire a thorough practical knowledge of tools and their uses. Then he resumed teaching, first at the Delaware Literary Institute, Franklin, N.Y., and later at Antioch College, in Ohio. He next went to the Iowa State Agricultural College, at Ames, Iowa., as professor of mechanics and physics, and in 1872, he was called to fill the chair of physics at Cornell University. During a fifteen year career at Cornell, he did much to originate and develop a course of study in electrical engineering, which was one of the most important in the university. In 1887, he accepted the position of consulting engineer of the Mather Electric Co., at Manchester, Conn., a position he resigned from in 1893 to open an office in New York City as consulting electrical engineer and electrical expert, which he continued until 1901. In 1894, Anthony became a professor of physics at the Cooper Union night school of science. In connection with Prof. Brackett, of Princeton University, he published "Elementary Text-book of Physics" (1887) and in 1898 he published "Lecture Notes on the Theory of Electrical Measurements". He regularly contributed to scientific journals and magazines for many years. Anthony was a member of the American Association for the Advancement of Science, the American Institute of Electrical Engineers, and the Franklin Institute, of Philadelphia, Pa. In 1861, he married Eliza Mathilda, daughter of James and Caroline (Remington) Girven, and had one son, Charles C. Anthony. This page was last edited on 19 May 2018, at 03:17.